Ladies and gentlemen, define 'priceless.' I present the Guennol Lioness, to be auctioned at Sotheby's very soon (December 8) in what promises to be a paddle-waving frenzy of heavy hitters in the art world. The Lioness has haunted my imagination ever since I first encountered her many years ago in a book about the art of the ancient Near East. I'll never forget how stunned I felt at the sight of those merciless elegant contours and juts, feral with a terrible touch of humanity; I know my gasp was audible. I'd thought her bigger--Ozymandian proportions would have worked perfectly--but even at three and a half inches tall she's massive. I'm almost glad she doesn't have legs, since they might have diminished her breathtaking force (historians have theorized that the limbs were made of precious metal and therefore stolen, leaving the remains intact and unvalued--yet another of fate's piquant ironies). Drilled into the back of her exquisitely savage skull are holes by which she could hang around the neck of some lucky purple-robed satrap. So far I only know her in two dimensions, having never made the pilgrimage to Brooklyn where she's resided for decades, but I hope someday soon that will change. 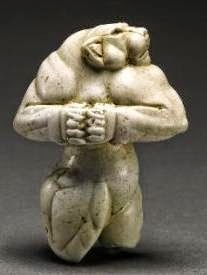 Despite her admittedly cool resemblance to a video-game anthromonster, the Lioness had her birth in Babylonia at about the time the wheel was invented, five thousand years ago. The crown jewel of a dazzling private collection, she's expected to realize anywhere from 14 to 18 million dollars, which seems more than reasonable to me considering what too much junk fetches nowadays, and the proceeds will be donated to charity. Is it any wonder I have hope for mankind, when it creates things like this, and sells them for a (hopefully) noble cause?